Back in April I shared with y'all an ornate french writing desk that I had purchased. I was super giddy over it! This is the desk. Since I posted about it I have had many inquiries about when I was going to be done with it. It was in worn shape for sure with drink rings on the top and was tacky because the owner had put a coat of stain on the top without sanding it down first. It required some loving indeed. A few weeks back I shared this sneak peek of it on my blog FB page. I had just finished with a crackling technique. Well here is the long awaited reveal! It is100% finally completed. I just loved all the ornate detail that this desk has and knew once I painted it it would pop out even more. The desk has one drawer. It went thru several layers of paint and distressing. I love the time worn feel it has now. I sanded down the top of the desk and put new stain on it. Then I added not one, not two and not three but four layers of semi gloss poly to seal it. I was initially only going to do two coats but since I normally work just with wipe on poly I was majorly obsessed with not being able to see brush strokes and those darn little bubbles that sometimes show up with poly. I may have gone a little over board but I think it was worth it. The desk has carvings on all four sides which you do not find often. I call this the back of the desk but really I guess it could be the front. I used my Annie Sloan Chalk Paint on this piece. Let me tell ya I was working on and still am working on a custom buffet that I used latex on. I have not really used latex paint in over a year so it actually kinda scared me even though that use to be all I ever painted with. All was fine with it but honestly it just reaffirmed my love of chalk paint. The Hubster is madly in love with this desk. He wants to keep it and put it in his office. Not sure why cause I think its kinda girly for him but I won't tell him that! ;) The office is already completed and by replacing his desk with this one will totally throw off the entire room. Sadly enough I think I will be selling this piece. We just have no room for it. I have tried to see where I could work it in anywhere in our home and it just won't fit. Sorry honey! :( I am truly honored though that he wants to keep this piece for himself. It will be a hard piece to let go. I have been working almost non stop so I will have a few more reveals coming up soon! :) Hope y'all are doing well and thanx so much for sticking with me and stopping by to visit even though its been very quiet around here. I appreciate all of you so very much! It's absolutely gorgeous! What a transformation and just look how the carvings really stand out now! Love it! Love your desk Pamela. I love the top in the dark stain with the poly coating. It's very pretty. oh Pam.. you've done a fabulous job on that piece. I love it~! This looks like a high end piece! WOW! I am looking for a french inspired desk to go in my living room! Just stunning and now I am inspired to find and paint one myself! Pamela, that is gorgeous. Too bad you have no place for it. I always find things I have no place for, too. Just beautiful, Pamela! I love how you dressed up the top, it shows her off perfectly. It would be great to use as a desk in front of a bay window with all the sides having that detail on it. Pamela, Your desk is stunning! You did such a beautiful job with it. Hope you can find a place for it. 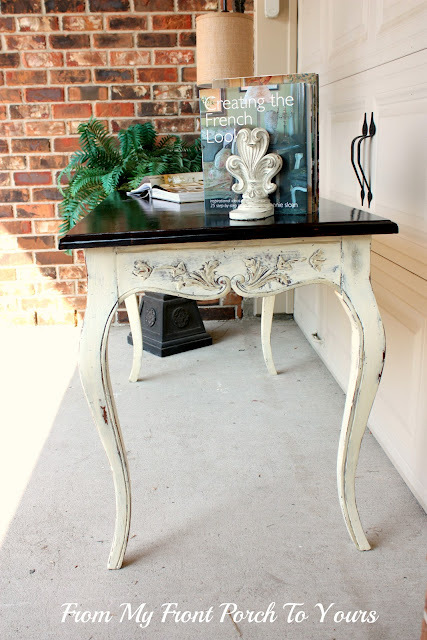 Its amazing to me how a coat of paint can really transform a piece of furniture! You really did a great job and i love the contrast! it turned out really fabulous! I had to laugh about your husband. I had a desk like that for many years, and my son was having a duck fit for it, so I let him have it. It is so funny that he of all people wanted something that I too thought looked rather girly. Absolutely beautiful Pamela!! I love how pretty you have it staged for the photo shoot too! Love that lamp!! Funny about your hubby! This piece is beautiful. Great color choice. Love the curved legs and the floral carving. Oh Pam --- I truly think that that is the most beautiful desk I've laid my eyes on! I am head over heels in love with it!!!! I sure wish I lived closer. I'd buy it from you in a heartbeat!!!! :) Great job! The table turned out magnificent....You truly did a fantastic job!....You are going to make someone a very happy buyer!....Love all the details! Whom ever is the new owner of your fabulous desk is going to be so very happy. This one will be very hard to part from. That looks AMAZING Pamela!! Girl you have got a gift for sure and it is just absolutely gorgeous. Well done! Great Job Pamela, The desk turned out beautiful. You just have to find a place for it! LOL It is so gorgeous!!! You did a beautiful job restoring it! Very, very pretty!!! This desk is absolutely stunning! You did a marvelous job on it and yes, it is quite intricate in design. I would be so very sad not to keep it. This was worth the wait; it's just gorgeous! Pamela, thanks for coming back by and following. I look forward to the reveals to come. So sad to have to let such a treasure go. But that just means there's something else out there for you to turn into fabulousness. I love what you did with the desk Pamela. The paint lets the beautiful detail show up and makes the entire piece look so charming. it looks beautiful! I h0pe you will link up this wonderful post to the Thursday hop.Hugs! It is totally gorgeous, thanks for sharing at cowgirl up. My hubby too wanted to replace our big clunky desk with a French one, but the old desk has many drawers and files drawers, so I would need another credenza to hold the stuff if I replaced the desk. Any way we'll probably be moving into town in a few years to a smaller house, so we may not have a study there any way. BWT, we will keep the ranch, just moving closer to her job, for our city house. Then it really will be a true city house, and not a suburban house, ha. You did a great job, looks great! WOW -- that is a beautiful piece and the white really DOES bring out all of the wonderful details! How rewarding to take something that was a 'throw away' item and give it a new life! Well worth the wait for that beauty! Love the carving and the two tone! I can see why Hubs likes it! Stunning makeover Pamela, you did a beautiful job on it. It turned out so beautifully! Love it!! Beatufil job! What a great eye to bring out the detail of the table, it is simply gorgeous! If you get a minute, I would love to have you stop by and share at my weekly Chalk Paint link party.